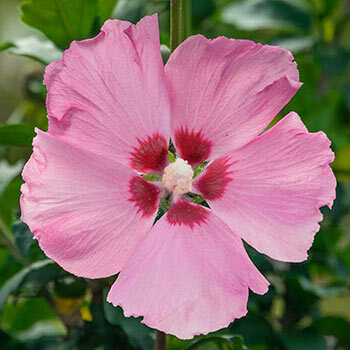 Whether you plant this beautiful hibiscus in a back border, as a privacy screen or in a focal point garden, you'll love what it brings to the landscape. Big, ruffled single blooms of pink are highlighted with a bright red eye-a great coloration that makes an impressive floral display. The fast-growing, 3-4' plant is covered in deep green, maplelike foliage that makes a great backdrop for the pretty flowers. Easy to grow and maintain, simply prune to keep the spherical standard form. Aphrodite is drought tolerant and highly attractive to many types of pollinators. As butterflies, bees and hummingbirds are lured in, they will benefit the entire garden. Foliage Type: Palmately veined, 3 lobed, coarsely toothed along the margins. Dark green, heavily textured. Planting Instructions: Plant firmly at the same depth as the plant is set in the pot. Water thoroughly. Thrives in the heat. Winter Care: None, except to mulch the first winter in areas with colder climates. Remove early the following spring before growth starts. Additional Information: Remarkable frost and pollution tolerance. An all round winner of great beauty. 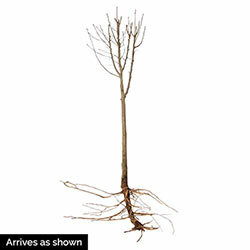 It can be used as a specimen, grown alone or set in a border, for a screen or hedge, or pruned shorter to make a small tree.